Kia Picanto uncovered | What Car? Someone wrote to us recently asking why Korean manufacturers have become so successful. Its one of those questions where you feel like saying how long have you got?, but its also possible to answer in one word: product. Get the cars right and price them sensibly and you cant go wrong. Kia has been doing a lot of getting cars right recently. Soul, Sorento, Sportage theyve got plenty going for them, led by a new-found sense of style, ever-improving quality and smaller, more efficient engines. The pipeline is far from running dry. 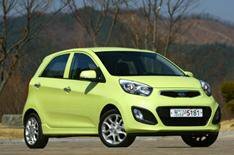 Therell be an all-new Picanto in May and an equally new Rio in the autumn. The Picanto is based on the platform and engines of parent company Hyundais i10 a promising starting point but its more exciting-looking (anyone else see a hint of Fords Ka in it?) with a sharper, more European interior. The plastics are solid rather than squishy, but they still seem a grade or two better. Safety is vastly improved over the old Picantos, with stability control likely to be standard, and you can have the sort of gadgetry you wouldnt have found in a family hatch a year or two ago, right down to a heated steering wheel. However, it means the starting price will now be closer to 8000 than 7000. The engines are a 68bhp three-cylinder 1.0 and an 84bhp four-cylinder 1.25, all capable of more than 60mpg with manual transmission. If the larger unit impresses for its flexibility it pulls effortlessly, if not strongly, from just 1500rpm the three-pot has an endearing thruminess that makes you enjoy having to work it to extract its modest performance. The common denominator is refinement: both are smooth and well silenced. Enlarge: Click the bottom right of the photo (above) then use your mouse to navigate around the Kia's cabin. Click the photo again to restore.All the controls are light an essential in a car that will spend a lot of time in town but the Picanto also feels suitably grown-up at higher speeds. Its stable and quiet, generally rides nicely in a firm sort of way and doesnt topple around when confronted with a bend. The biggest variable concerns the electronic power steering, which was reasonably direct and nicely weighted in the 1.25, but sticky and a bit vague in the 1.0. The Picanto has grown in length as well as grown up, but its still less than 3.6 metres long. It now seats four with ease, and an almost flat floor leaves plenty of foot space. The boot is 27% bigger, too, and is far more than the token gesture you find in some small cars. You seem to be perched quite high, even with the front seats in their lowest setting, but the cabin is airy and bright and the driver gets a good all-round view. The switchgear layout is logical, although eight buttons and two toggles to work the stereo system seems to be gilding the lily. The new Picanto is a likeable small car thats far better than just a town runabout, and it has a bit more about it that the Hyundai it shares so much with. If you dont fancy the five-door therell also be a three-door this time with its own distinct look. Now wait until you see that. Easy to like, even at the higher price.